Since 1894, the Rosso family has been making exceptional cheeses that reflect the unique traditions of northern Italy’s alpine Biellese valleys. For all their specialty cheeses, Pier Luigi Rosso Dairy uses only the freshest, highest quality milk from the two regionally indigenous cattle breeds: "Pezzata Rossa d'Oropa" (Red dappled) and "Bruno Alpina," that graze indulgently on the lush, unspoiled, high altitude pasturelands. Rosso Gratin Bleu is made from whole cow’s milk and acquires its beautiful veining from Penicillium Roquefort. Once formed, each wheel is placed on sliver fir-wood boards in underground cellars and turned and massaged every week during maturation. After 60 days, Gratin Bleu acquires an exquisite taste: initially sweet, that gives delightful way to a lingering spicy sharpness. Semi-soft, Gratin Bleu has a compact, crumbly interior that is creamier near the inedible, gray/brown rind. About 30 years ago, Caseificio Pier Luigi Rosso adopted the symbol of the “Gipin” (Biella’s carnival mask) as their symbol, to emphasize the dairy’s commitment to upholding the culture and traditions of their distinctive providence. Application: Primarily Gratin Bleu is known as a refined table cheese, but adds delicious depth to salads, dressings, dips, stuffed chicken or pork, gourmet burgers or in any recipe calling for a robust blue taste. Pairing: Full-bodied rich red wines in general pair well, but a special cheese deserves a special wine. An aged Barbaresco from the Piedmont region is an excellent choice. Product Details: #050247 | 2/5.7 Lbs. In Calabria southern Italy, hot peppers are deeply embedded in culinary tradition. These chili peppers are such a necessity to the culture that the Calabrese grow them at home so they are readily available at all times. 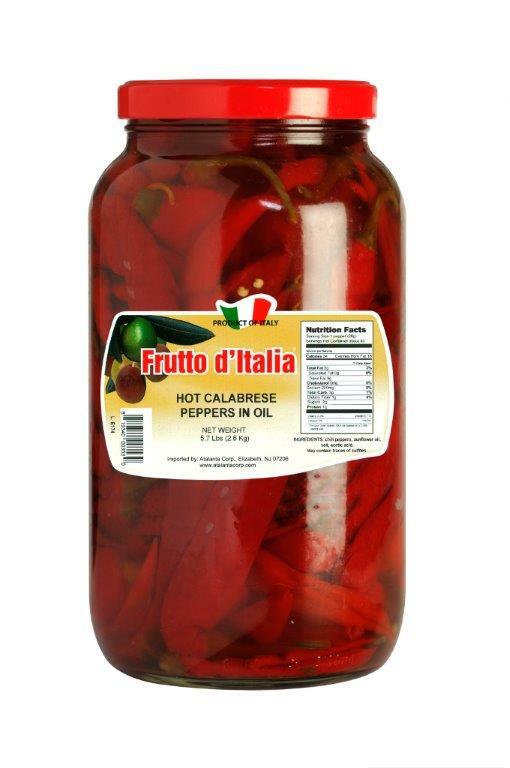 Frutto d’Italia’s Hot Calabrese Peppers are of the "capsicum frutescens" variety. Jarred with a careful blend of herbs, oils and spices, this hot pepper marinade will add the perfect amount of spicy lift to pizzas, pastas, eggplant dishes, salads, sandwiches… Basically, the Calabrese vow, any recipe that needs some Italian spiciness.